The new Sea Dragon 2000F UW photo-video-dive light delivers 2000 true lumens and a smooth, even 120° wide beam angle. This revolutionary COB LED array technology produces an 80 CRI (color rendering index) that mimics natural daylight. Most other LED’s have 70 CRI, missing wavelengths of the visible light spectrum. 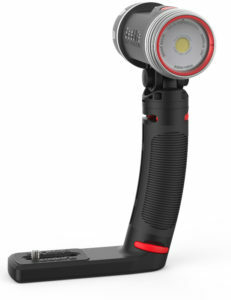 Uncover colorful reefs and hidden sea creatures with this 3-in-1 photo-video-dive light. Includes Flex-Connect™ Micro tray and grip. The Sea Dragon 3000F is easy to expand with SeaLife’s Flex-Connect system of trays, grips, arms and adapters. The 3000 can be connected to any underwater camera system using standard ¼-20 tripod or GoPro camera mounts. Flex-Connect ball joint, YS and cold shoe mounts are available making the Sea Dragon 3000 compatible with any underwater camera.